Everyone needs the Best Strawberry Shortcake Recipe and this is it! These Strawberry Shortcakes are fresh yet decadent at the same time. They boast an additional flavor burst to the traditional dessert you have to taste to believe. 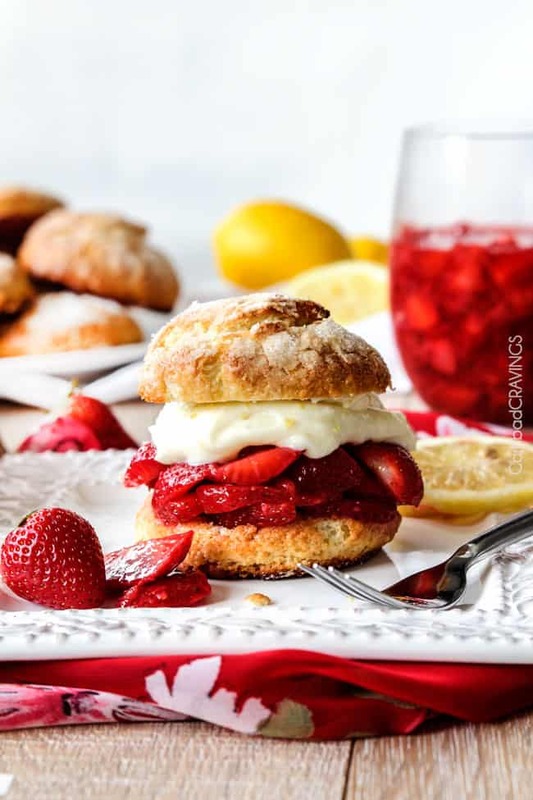 This easy Strawberry Shortcake recipe is loaded with fresh sugar kissed strawberries, generous dollops of sweet citrus Lemon Curd Whipped Cream all piled on light, tender cake-like biscuits for the best Strawberry Shortcake recipe ever! These Strawberry Shortcakes are also a great make ahead dessert AKA ultimate stress- free entertaining dessert! My good friend, Melanie, brought Strawberry Shortcake to our Fourth of July Feast and they were delish! But she lamented her biscuits were store-bought because after trying many recipes, she couldn’t find a shortcake recipe with the proper biscuit. 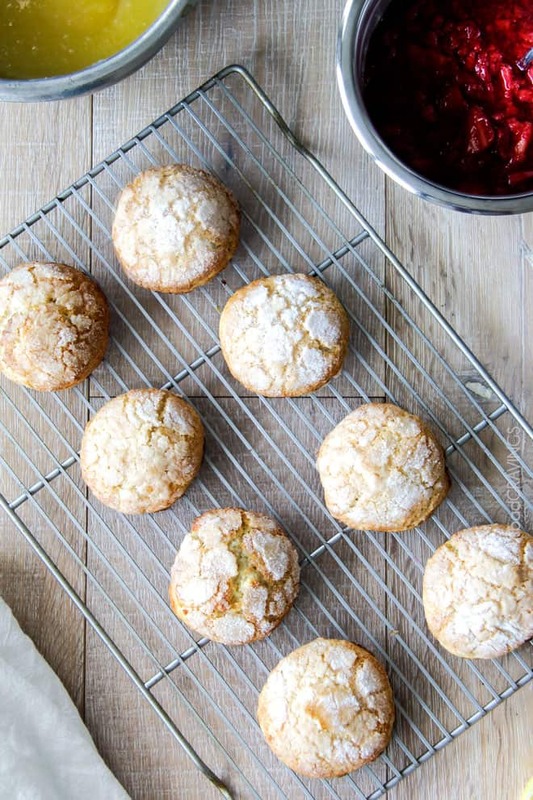 Biscuits: These biscuits are slightly sweet dusted with sugar, light in texture but still sturdy enough to compliment the mountain of strawberries and their permeating juices. Strawberries: The strawberries themselves are a combination of mostly thinly sliced strawberries with just enough mashed strawberries to create a luscious fresh strawberry juice/syrup coating. Whipped Cream: But the real unknown star of the show is Lemon Curd Whipped Cream. OH MY YUM!! I am kind of proud of this creation and more than obsessed with it. I’ve created Lemon Curd Whipped cream that is silky, slightly tangy and the perfect compliment to the sweet strawberries. Why Is it Called Shortcake? Before we dig in, let’s talk shortcake. Traditional Strawberry Shortcake is made with freshly baked biscuits topped with fresh, sliced macerated strawberries and homemade whipped cream then crowned with another biscuit.Many people assume Strawberry Shortcakes get their name due to their height, but the name actually comes from the ingredients. The earliest recipe for shortcake is in an English cookbook from 1588. The old English definition of a “short” cake is one that has a high ratio of fat (butter or shortening) to flour and sugar.You stir the dough just until the dry ingredients are moistened and a soft dough forms. When baked, the cake is crisp and crumbly or a SHORTCAKE.Even though the name has English origins, most everyone agrees that shortcake was an American invention. But no matter who invented the traditional Strawberry Shortcake Recipe, I’m grateful they did! Where do Traditional Strawberry shortcakes Come From? Like all desserts passed down over generations, an evolution occurs before we arrive at our modem day Strawberry Shortcake recipe.An early version of the Strawberry Shortcake, in the The Ohio Cultivator (Columbus), June 1, 1845, was made with a thick unleavened cookie, split, layered with fresh strawberries, and covered with a hard sugar-and-egg white icing. 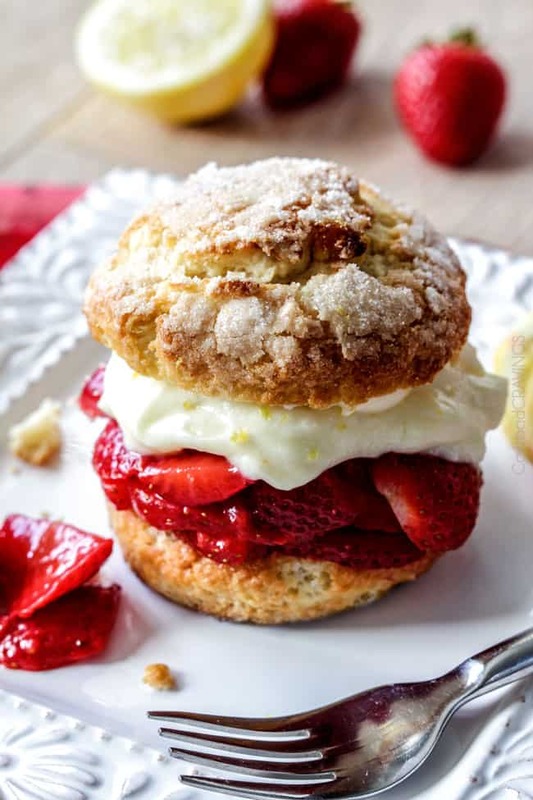 I’ve given a nod to this expert technique and sprinkled my biscuits with sugar.In 1869, with the new transcontinental railroad, the shipment of California strawberries on ice contributed to a surge in popularity of shortcake throughout the country. Whipped cream’s popularity spread in America corresponding to refrigeration, and it became standard in the dish. It wasn’t until 1910 that French pastry chefs replaced the topping with heavy whipped cream.In the United States, Strawberry Shortcake parties were held as celebrations of the summer fruit harvest, officially making June 14 Strawberry Shortcake Day – who knew?But know we DO know, so let’s celebrate with my Strawberry Shortcake Recipe! 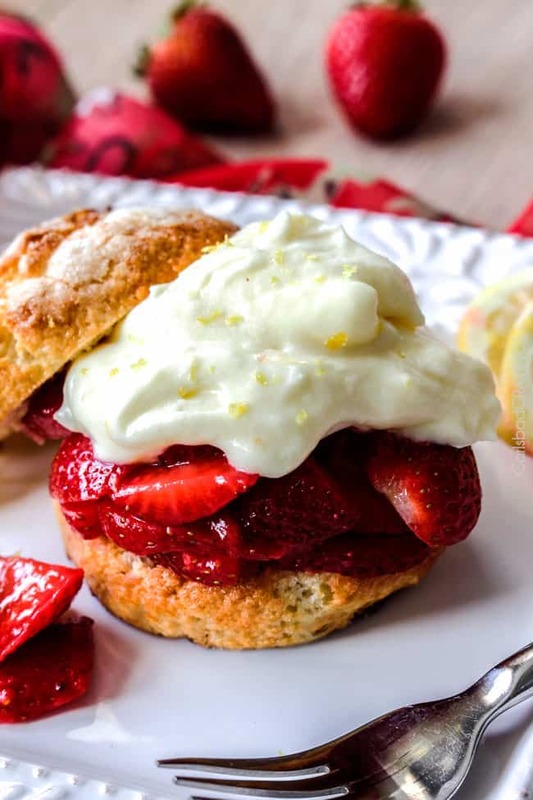 My recipe celebrates the traditional Strawberry Shortcake by taking the best of what grandma dished out and adding my spin with lemon curd whipped cream. I’m grateful for the old so we can celebrate with the new! Among the developments that distinguished 19th century American baking (and classic strawberry shortcake) from England was the addition of potash (baking soda today) to baked goods.Because of chemical leavening, American shortcakes became lighter and fluffier than the English originals. You can’t call these hardtack!So, while the term biscuit means “cookie” in England and many parts of the world, in the United States, it refers to a lighter, fluffier baked good that is crispy on the outside and soft on the inside.So, the long answer is yes, shortcake is a fluffy, sweeter biscuit by American standards, and not English standards. Cake or Biscuits for Strawberry Shortcake? Today, many Strawberry Shortcake recipes give you the option of making your shortcake with either cake or biscuits. But both Melanie and I agree proper, successful Strawberry Shortcake isn’t sandwiched in between sponge cake, pound cake or angel food cake – although delicious – it’s just not strawberry shortcake.More importantly, soft cake cannot successfully hold up to the moist, macerated strawberries without becoming soggy in minutes. But never fear, the perfect biscuits are here!When Melanie challenged me with making the perfect Strawberry Shortcake, I remembered my American Test Kitchen Best Ever Desserts Magazine – Page 54 – the perfect shortcake biscuits! From my cookbook to your kitchen, you will LOVE these biscuits! Season: Make Strawberry Shortcake when strawberries are in season! Fresh strawberries will deliver the sweetest, deepest flavor. 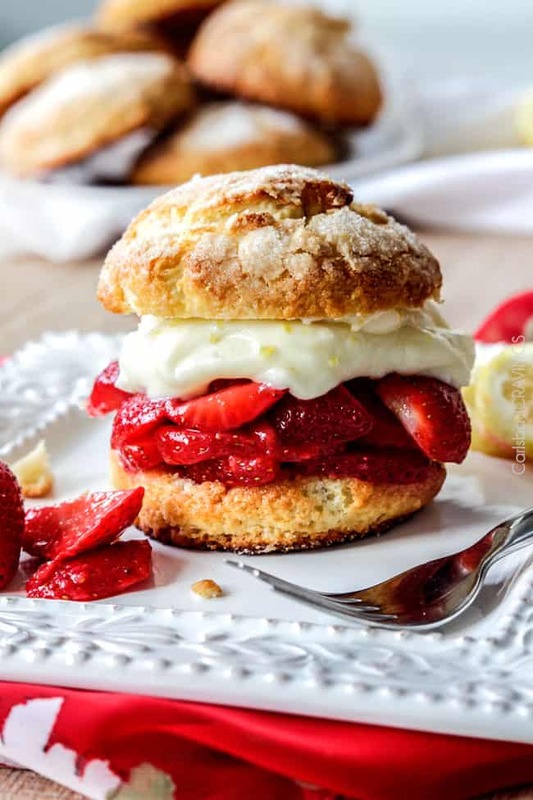 Strawberries are in season from spring to early summer, making Strawberry Shortcakes perfect for Easter, Mother’s Day, end of school and Father’s Day. Best Strawberries: Choose strawberries that are dark red, firm and fully ripe. Don’t Soak! Never soak strawberries in water or they’ll lose some flavor and nutrients. Hull Strawberries: Hulling simply means removing the leaves on top of the strawberry and the white portion surrounding it – the “hull.” To properly hull a strawberry, use a sharp knife to cut a circle around the stem at an angle then remove the hull. If you don’t want to go to the trouble, you can simply chop the top of the strawberries off. Mash Strawberries: Mashing some of the strawberries is unique to this easy Strawberry Shortcake recipe. The mashed strawberries, when combined with sugar, creates a luscious strawberry glaze. You can use a potato masher, fork or any other useful utensil to mash 2 cups strawberries. Slice strawberries: You’ll slice the remaining strawberries into ¼-inch thick slices then stir them into the mashed strawberries along with the sugar. Make sure you don’t slice the strawberries too thin, because we want them to hold their shape. 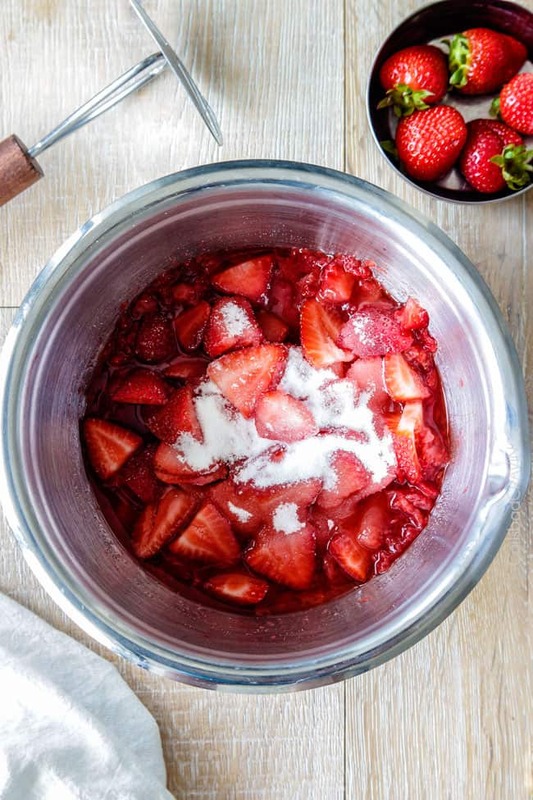 Macerate: macerating is the process in which the sugar draws moisture out of the strawberries and dissolves to make a syrupy strawberry sauce. If your strawberries are super sweet you can use less sugar, but only if they’re really sweet. Chill: Give the macerating some time! You can chill the strawberries for as little as 30 minutes, but the strawberries will become much juicier, the longer the macerate – 4 hours seems to be about right. You don’t want to macerate longer than 24 hours or the strawberries can become mushy. Cold Butter: Make sure the butter is cold or it will make the flour mixture mushy instead of create a mealy texture. To keep the butter cold, chop it and then chill it. Food Processor: I use the food processor to make the dough and it is SO EASY! All you have to do is pulse a few times – it literally takes minutes! If you don’t have a food processor, you may cut the butter in the old-fashioned way. Texture: Pulse the butter and flour mixture until it resembles coarse meal. You want the largest butter pieces to be about the size of peas. Don’t Overmix: Stir flour mixture into half and half/egg until large clumps form. Turn dough onto lightly floured counter and knead gently until dough comes together. You don’t want to overmix or your biscuits will be flat and dense instead of light and fluffy. Work Quickly: Once the dough is formed, you want to work quickly otherwise the dough will warm and the butter will melt. We want the butter to melt while baking and NOT while rolling. As the butter melts during baking, small air pockets are created, giving the biscuit its flakiness. Flour Cutter: Pat dough into 9×6-inch rectangle about 3/4 inch thick – it doesn’t have to be perfect! Use a biscuit cutter, or whatever circular glass you have that is roughly 2 1/4 inches diameter. Dip whatever cutter you use in flour before using each time so it doesn’t stick to the dough. Press Firmly: Make sure you firmly press straight down with the cutter each time so you make a clean cut and don’t tear the surrounding dough or twist the dough. Twisted dough will bake up slanted and unevenly. Chill: Space rounds at least 1 1/2 inches apart on parchment paper or nonstick mat lined baking sheet. Refrigerate for 20 minutes to chill the butter once more and to make sure the biscuits rise and don’t spread. Bake Immediately: After chilling briefly, bake the biscuits immediately. Dough with baking soda should be baked within an hour of mixing, the sooner, the better, otherwise the baking soda will lose its efficacy. Golden Crunchy Tops: Brush biscuit tops with egg whites and sprinkle evenly with sugar. Brushing the biscuit tops with egg whites not only glues the sugar in place, but promotes a rich golden-brown color. 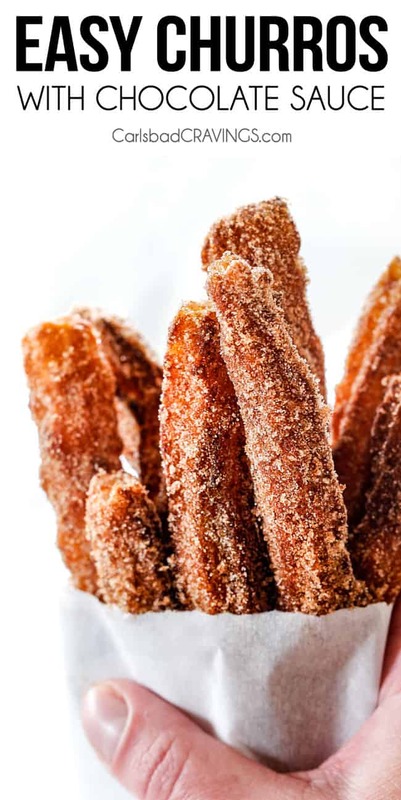 The sugar crystalizes and forms a sugary, crunchy crust. Don’t Over Bake: Bake just until the tops of the biscuits are golden. Overbaking can result in dry shortcakes. Store Bought Lemon Curd: If you want to skip making homemade lemon curd, store bought lemon curd is usually located by the jams/jellies. Don’t boil: Melt butter in medium metal bowl set over large saucepan of simmering water. To this metal bowl, whisk in sugar, lemon juice, lemon peel, and salt; gradually whisk in egg mixture. You want the pan to be hot but not boiling or it will scramble the eggs upon contact. If you know your stove runs hot, then reduce the temperature. Stir Constantly: The key now is to whisk constantly until thickened. How Thick? The lemon curd should be thick enough to cling to your spoon. The lemon curd will continue to thicken in the refrigerator, so don’t be alarmed if it’s not as luscious as you would like. Strain Curd: This step is optional, but you can strain the curd through a fine-mesh strainer/sieve into a small bowl to get rid of any small egg bits that may have formed. And now you have rich, creamy, sweetly tart Lemon Curd! Make ahead: You can cover and freeze the Lemon Curd for one hour or refrigerate until ready to use. Chill Bowl: When it comes time to make the whipped cream, make sure the heavy cream is cold. Cold cream helps to achieve more volume. You can even place your metal mixing bowl and beaters in the freezer to chill it first. Don’t Overbeat: Start mixing on low speed then increase to high. Beat just until soft peaks form, about 3 minutes. Take care not to overbeat or the cream will start to separate. Add Lemon Curd! 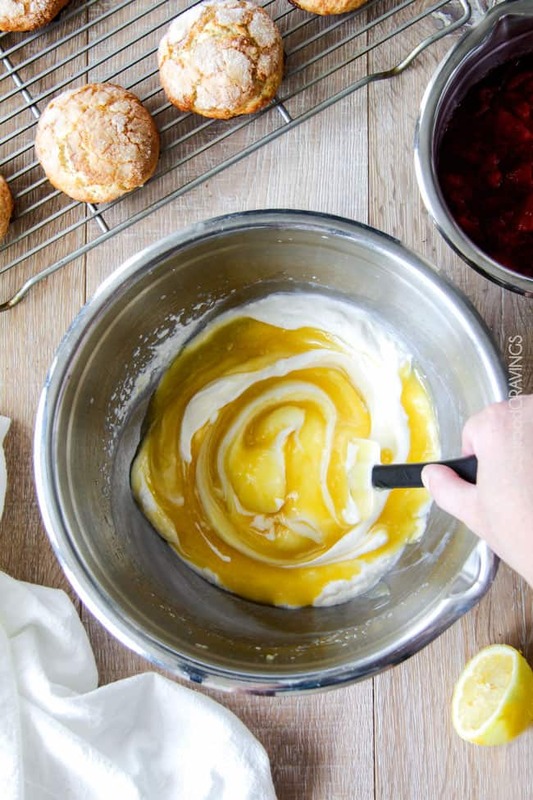 Gently fold cooled Lemon Curd into Whipped Cream until completely combined. Can Strawberry Shortcake Recipe be made in advance? Yes! I find it easiest to make components of the Strawberry Shortcake dessert a day in advance because both the strawberries and lemon curd require time to chill. I make everything except the whipped cream ahead of time, then the day of serving, I whip the cream and fold in the lemon curd – easy peasy! Heavy Cream: the cream can be whipped up to 2 hours ahead of time and refrigerated, covered. If necessary, lightly rewhip before using. Biscuits: The shortcakes can be baked up to 2 days ahead of time, allowed to cool completely, then stored in an airtight container. They can also be made early in the morning and left out until ready to assemble that day. For best results, I like to warm the biscuits at 350°F in the oven just before serving for slightly warmed, flaky results. Strawberries: the fruit can be chopped up to three days ahead of time and tightly covered and stored in the refrigerator. The strawberries can be combined with sugar, covered, and chilled up to 24 hours ahead of time. Can I Freeze strawberry shortcake? You can freeze elements of the strawberry shortcake. Both the biscuits and lemon curd freeze well, but I don’t recommend freezing the strawberries (they will become too soft) or the whipped cream. Completely cool shortcakes on a wire rack. Bulk freeze: Place rack in the freezer and freeze shortcakes until solid. Place frozen biscuits in a freezer bag and squeeze out any excess air to prevent freezer burn. Individual freeze: I like to the slice biscuits first, skip the flash freezing step, and instead wrap biscuits individually in freezer wrap then add to a freezer bag. This way I can prepare single servings when needed. Baked products should be stored at 0°F or lower. Use biscuits in the next 2 to 3 months for best results. Microwave: for frozen, microwave on HIGH for 2 to 4 minutes; for thawed, 10 to 20 seconds. Oven: wrap shortcakes in a single layer in foil (so they don’t dry out) and place on a baking sheet. For frozen, bake at 300°F for 20 minutes; for thawed, bake for 10 minutes. Mint: Try adding some mint to the strawberries! Fruit: While strawberries are our countries favorite, there is no need to stop there. Blueberries, bananas, peaches, any berries or berry combo are all great fruit to wedge inside this delectable shortcake. You can even create red, white and blue shortcakes for the 4th of July! Shortcake: you can use traditional whipped cream instead of lemon curd and add 2 teaspoons lemon or orange zest to the dough. You can also add sliced almonds or poppy seeds. Whipped topping: Forgo whipped topping and add a streusel instead. If doing this, make sure to serve with something creamy like vanilla ice cream or lemon sorbet. Shortcake Sheet Cake: Cook shortcake in a Pyrex baking dish and make a sheet cake dessert. I cut the top half off, add the strawberries, then crumble the top all over the strawberries. Top with lemon curd whipped cream or plain whipped cream. This can be an easier, more efficient way to serve a large group. They can even scoop out their own serving. Trefoil: Use all these recipe components to assemble a trefoil dish! I would love to hear how you take this amazing Strawberry Shortcake and personalize it for you and your family! I hope you enjoy what I took from the best of tradition to create my lemon infusion Strawberry Shortcake!And before I go, I dare you to beat the following record….and invite me to help you eat it: the largest strawberry shortcake ever made was in the town of La Trinidad, Benguet in the Philippines on March 20, 2004. It weighed 21,213.40 lb (9622.23 kg.)! 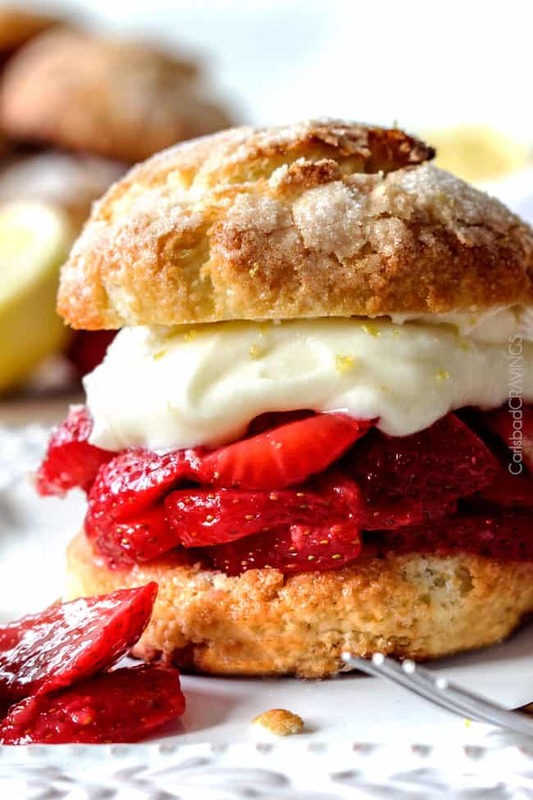 Want to try this Strawberry Shortcake Recipe? Everyone needs the Best Strawberry Shortcake Recipe and this is it! These shortcakes are fresh yet decadent at the same time. They boast an additional flavor burst to the traditional dessert you have to taste to believe. 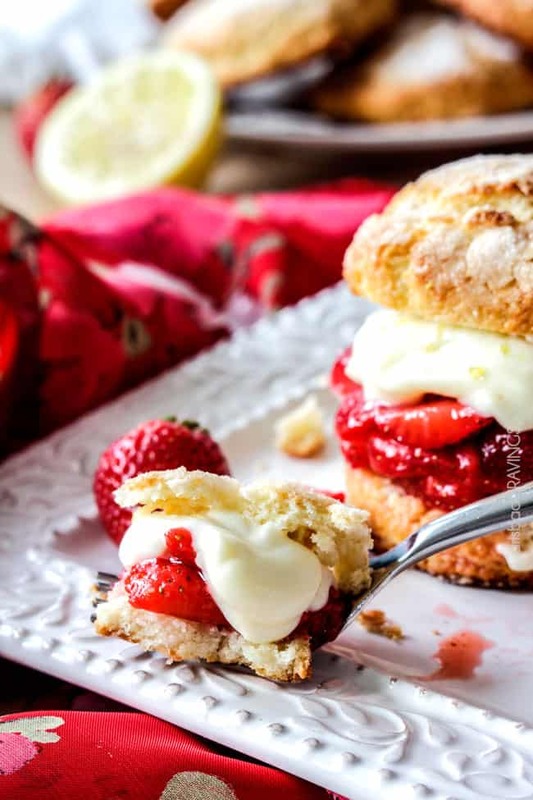 This easy Strawberry Shortcake recipe is loaded with fresh sugar kissed strawberries, generous dollops of sweet citrus Lemon Curd Whipped Cream all piled on light, tender cake-like biscuits for the best Strawberry Shortcake recipe ever! These Strawberry Shortcakes are also a great make ahead dessert AKA ultimate stress- free entertaining dessert! Lemon Curd: Whisk egg and egg yolk in medium bowl, set aside. Melt butter in medium metal bowl set over large saucepan of simmering water. To this metal bowl, whisk in sugar, lemon juice, lemon peel, and salt; gradually whisk in egg mixture. Whisk until thick and thermometer inserted into curd registers 178°F to 180°F (it will continue to thicken upon standing). Transfer to small bowl. Cover with plastic wrap and freeze 1 hour to cool or refrigerate for up to days in an airtight container until ready to use. Strawberries: Using potato masher, mash 2 cups strawberries in a large bowl. Cut all remaining strawberries into 1/4 inch thick slices. Stir sliced strawberries and sugar into crushed strawberries. Refrigerate mixture until sugar has dissolved and strawberries are juicy, at least 30 minutes up to 24 hours. Biscuits: Preheat oven to 425 degrees F.
In a large bowl, whisk half-and-half and whole egg together. Set aside. In food processor, pulse flour, 3 tablespoons sugar, baking powder and salt until combined, about 5 pulses. Scatter butter over top and pulse mixture until it resembles coarse meal, about 15 pulses. Stir flour mixture into half and half/egg until large clumps form. Turn dough onto lightly floured counter and knead gently until dough comes together (don’t overwork dough!). Pat dough into 9x6-inch rectangle about 3/4 inch thick. Using floured 2 1/4 inch round cutter (I used the top of a glass), stamp out 6 dough rounds, reshaping dough as needed. Space rounds at least 1 1/2 inches apart on parchment paper or nonstick mat lined baking sheet. Refrigerate for 20 minutes. Brush tops with egg white and sprinkle evenly with remaining 2 tablespoons sugar. Bake 12-14 minutes or until tops of biscuits are golden. Transfer biscuits immediately to wire rack to cool. If not using immediately, store in airtight container once cooled. Lemon Curd Whipped Cream: Beat heavy cream, sugar and vanilla extract on medium low for 1 minute. Increase speed to high and whip until soft peaks form, about 3 minutes. Gently fold cooled Lemon Curd into Whipped Cream until completely combined. Assemble: Split each biscuit in half and place biscuit bottom on individual plates. Spoon equal portions of strawberries onto biscuits followed by dollops of Lemon Curd Whipped Cream, then place biscuit tops on whipped cream. Serve immediately. *Total Time does not reflect cooling Lemon Curd or Strawberries as this will vary. **I find it easiest to make the dessert a day in advance because both the strawberries and lemon curd require time to chill. I make everything except whipped cream and then the day of serving, I whip the cream and fold in the lemon curd. A great make ahead dessert! 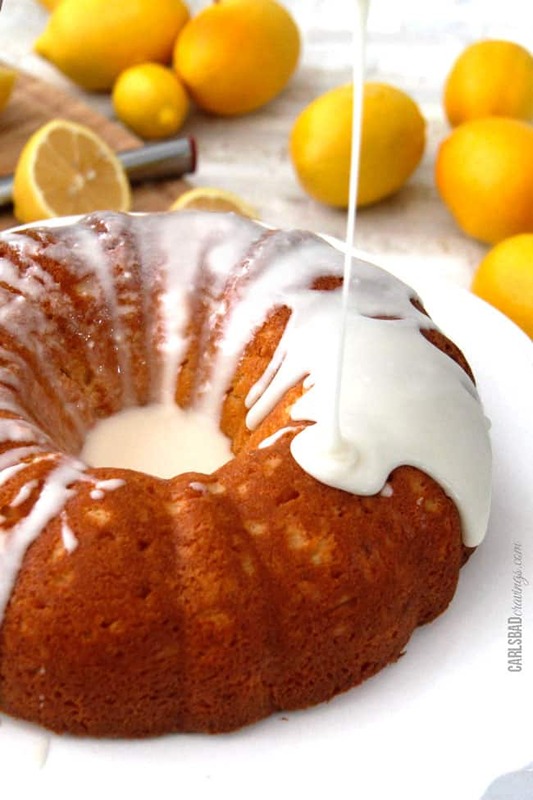 ***You can use store bought lemon curd - Trader Joes has a great one. ***See post for detailed tips and tricks. Hi Jen! If I were to buy a jar of lemon curd, about how much should I use to equal how much you make in this recipe? Hi Taryn, I haven’t measured it out, but I am guessing about 3 tablespoons lemon curd per shortcake – so a little over 2 cups – ish. Hope that helps, enjoy! Would it be ok to fold the curd & whipped cream together then serves about 4-5 hours later? Yes Lisa, that should work great! Enjoy! Thanks! I can’t wait, they look so tasty! Hi. I’ve been making strawberry shortcake in a square brownie pan since i was 10 yrs old. Where’s the nutmeg in this recipe for the “biscuit” part? Just asking for spice! Nutmegyankee! A square brownie pan is a great idea! I don’t use nutmeg in this recipe but you are welcome to add some!